Transforms an Ordinary Door Knob Into a Highly Sensitive Burglar Alarm!!! In order to gain easy access to your home, burglars will first try your door to see if it is unlocked. This device utilizes dual-sensing technology to enable it to protect both metal & wooden doors. For most doors (wooden door with metal knobs), the touch sensor will detect a person touching the outside doorknob and will instantly emit a loud 110 dB alarm to scare him away and alert you to the attempted entry. 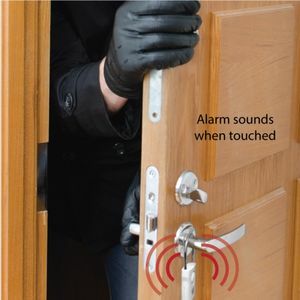 Even if he is wearing gloves, the Pro-Tec-Door Alarm will sound as soon as the outside door knob is touched. 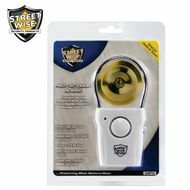 For metal doors or those with wooden or plastic door knobs, the vibration sensor will detect the attempted forced entry. 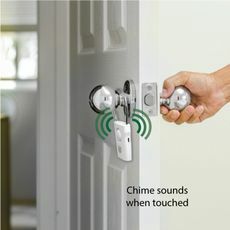 You can use the chime mode at home to notify you of visitors or in a business to announce customers.